A POLICE CAR, unmarked but with blue lights flashing, was parked in front of my Brookline synagogue when I arrived for Shabbat services late Saturday afternoon. Since Orthodox Jews don't turn on the TV, radio, or computer on the Sabbath, I knew nothing about the horrifying slaughter that had occurred at the Tree of Life Synagogue in Pittsburgh six hours earlier. But my local police department knew, and had dispatched an officer to be on hand as congregants like me showed up for the late-Sabbath worship — just in case. After Shabbat ended on Saturday night, the National Council of Young Israel, an umbrella organization of about 135 Orthodox synagogues across North America, emailed a statement expressing "tremendous shock and extreme pain" at the bloodbath in Pittsburgh. But the council's message went beyond voicing communal grief. 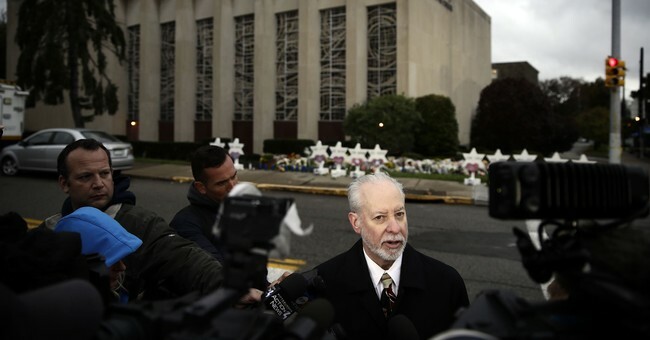 "This massacre is a stark reminder of the need for every synagogue to employ security measures to keep their congregants safe," it said. "With anti-Semitic incidents in the United States on the rise and an uptick in religion-based hate crimes, it is critical that steps be taken to harden our synagogues." In the America I grew up in, synagogues didn't have to be hardened. The shuls I attended —as a kid in suburban Cleveland, as a college student in Washington, DC, and for years after moving to Boston — were open to all and largely unconcerned with security. The same was true of the Jewish day schools I attended, and the campus Hillel House where I used to eat, and the Jewish bookstores I sometimes visited. In the America I grew up in, Jews had nothing to fear from their neighbors. Unlike my father — a Holocaust survivor who immigrated to the United States in 1948 — I was reared in a culture where overt anti-Semitism was generally anathema, and where Jew-haters on the far left and far right kept their poisonous ideas mostly to themselves. The Nazi genocide, a crime that wiped out one-third of the planet's Jews, had so traumatized the West that anti-Jewish bigotry became repugnant in mainstream society. Having seen what can happen when anti-Semitism is indulged, the civilized world recoiled from it. In the America I grew up in, Jews not only lived in relative peace and harmony, but assumed that peace and harmony would go on indefinitely. Robert Bowers's rampage at the Tree of Life Synagogue on Saturday wasn't the first fatal attack on American Jewish organizations in modern times. Gunmen opened fire at the North Valley Jewish Community Center in Los Angeles in 1999, at the Jewish Federation of Greater Seattle in 2006, at the US Holocaust Memorial Museum in Washington in 2009, and at the Jewish Community Center in Overland Park, Kansas, in 2014. But Bowers — who was heard yelling "All Jews must die" during his attack — destroyed more lives than all the others combined. The next assault may be even deadlier. And only the willfully blind can believe now that there won't be a next assault. The post-Holocaust taboo on blatant Jew-hatred crumbled years ago in Europe and Latin America, where synagogues and Jewish schools are routinely protected by armed guards and metal detectors. Now it's crumbling in the United States as well. Of course the great majority of Americans have no stomach for anti-Semitism — last year, in fact, the Pew Research Center released the results of a survey showing Jews to be the most warmly regarded religious group in America. American Jews continue to benefit from a level of benevolence, respect, and freedom virtually without parallel in Jewish history. But the bigots are no longer inhibited about trumpeting their bigotry. The extremists and demagogues who scapegoat Jews — the David Dukes and the Louis Farrakhans, the sickening white nationalists and the fanatical Israel-haters — may reside on the fringes, but the internet gives them access to a vast potential audience. Bit by bit, their venom seeps into the mainstream. Steadily it take a toll on America's immune system. And every now and then it triggers another unstable zealot, hopped up on rage and xenophobia. In a famous letter in 1790, President George Washington reassured the nation's then-tiny Jewish community that in America they would not be persecuted. "May the children of the stock of Abraham who dwell in this land continue to merit and enjoy the good will of the other inhabitants," Washington wrote, "while every one shall sit in safety under his own vine and fig tree and there shall be none to make him afraid." Washington's words were a good description of the America I grew up in. But that America is changing. And now synagogues need to be hardened.